Well! 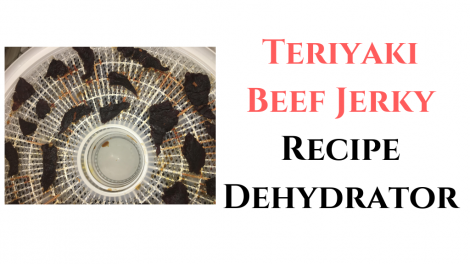 You can easily make the teriyaki beef jerky at your home with the help of a food dehydrator. It will not only save your money that you might have to spend on buying expensive store-bought jerky, but it is more nutritious and healthy also. In the below article, we are going to provide you with the teriyaki beef jerky recipe dehydrator along with some useful tips and info. We hope you read it till the end so that you can enjoy the best recipe ever. You should pick the lean meats for the teriyaki beef jerky that you can trim easily. If there is excessive fat on the meat then, this can turn the food rancid. Now, trim the pieces of meat cautiously by eradicating the entire noticeable fat. After trimming, freeze the meat so that it does not remain pliable while cutting. After freezing, you can feel that pieces of the meat are easy to cut now. So, now cut the meat against or across the grain. It will make the beef jerky easier and tender to chew. The strips of the meat must not be thick more than 1/4th of an inch. Now place the meat inside a Ziploc bag or the deep bowl and start the preparation of the marinade. Take all the ingredients mentioned above and mix it in the blender except the pepper and chili flakes. You have to blend the ingredients till the time all the spices, as well as sugar, didn’t get dissolve correctly. Now, add the pepper and chili flakes in the marinade and blend them well. Pour the marinade on the meat so that it gets coated flawlessly. The marinade must cover the teriyaki beef jerky entirely. After the marinating, cover the pieces of meat in the sealed bag and keep it inside the fridge for around 12 to 24 hours of the period. Keep stirring the teriyaki beef as well as the mixture of marinade intermittently to certify that all slices of the meat appropriately coated. The marinade might settle down after some time, thus ensure to mix it well. Pick your food dehydrator and cover its plastic shelves with plastic wrap or plastic sheets. The extra fats that come out of the meat during the drying might harm the trays after some time if you don’t safeguard them. Place the meat over the paper towels so that the excessive marinade mixture can drain off, and then put them on the trays of the dehydrator. There should be appropriate space among the slices of the meat so that the air can circulate appropriately among all the pieces of right dehydration. Now switch ON the dehydrator and set the temperature at 160 to 180 degrees for around 4 to 8 hours for dehydrating the meat. Jerky must be dry from all sides, and they should be dry adequately so that you can break its pieces effortlessly; however, it still has to be flexible to turn. Now, store the teriyaki beef jerky in the airtight container or bag and keep it in the fridge for long life. You can also freeze them for more long-term storage. A fan will help in the uniform drying of the jerky from all sides. A dehydrator without a fan will not dry out the food uniformly, and you might end with soft and chewy snacks. It is essential that your dehydrator can reach a temperature of 160 degrees F for making teriyaki beef jerky perfectly dried. If there is not enough temperature in the dryer machine then, you might not get the excellent result in the end. What are the Nutrition Facts of the dried teriyaki beef jerky? If you want to get the tender chew of the teriyaki beef jerky, try to cut the meat against the grain. It will surely make a difference in the end as against the grain you can easily chew. If you cut it with the grain then, it will turn into a much chewier texture. It is essential that you buy the best meat’s cut for making the teriyaki beef jerky. It can be flank steak, top round, top sirloin roast or London broil. All of them will work correctly for the recipe. The marinade of the recipe plays a very vital role in making the delicious jerky snack. It provides all the flavor to the food. Thus, you have to make the marinade with complete attention. The above recipe of the teriyaki beef jerky is spicy and sweet both. How long will the teriyaki beef jerky last? The homemade teriyaki beef jerky does not have any chemicals or artificial preservatives like the store-bought snacks for increasing its shelf life. You should consume it in two weeks if you are storing the jerky at the room temperature. But if you want to take it for the camping or hiking trip then, it’s better to store it in the fridge for around two weeks. Some of you might want to use it for the more extended period then, it’s advisable to store it in the sealed bag and keep it inside the freezer for six months easily. We hope that you like the above teriyaki beef jerky recipe for the dehydrator. You can use this jerky as a lunchbox snack, snack food or during the camping or hiking trips. Some people like to carry it along during long flights and tours. It is a gluten-free food that you can consume anytime you want. It is the best backpacking food as well. Moreover, you can use the teriyaki beef jerky in your meals after the rehydration. You can use 3 cups of the water in 1 cup of jerky pieces and soak them for thirty minutes for rehydration. Since lots of slats will come out during this process, you can throw the drenched water and use fresh water while making soup or stew. We believe that after having the taste of above homemade teriyaki beef jerky, you shall never return to purchase this delicious treat in the market for a second time. Don’t forget to share your experiences about the above recipe and do let us know if you added any twist to this recipe.